Most people who are in control, people who wield immense amounts of institutional power, do not believe that bias or prejudice limit people's opportunities. What they do believe is that anybody can overcome unfair limitations if they just work hard enough. I also used to believe that was true. It would be nice if it was true. But as I began studying over 100 years of social research on the practical and psychological impact of bias, I came to see that the real cost of bias is immense. And not just to the person whose opportunities are diminished but also to all who miss out on the value that person could add. This idea is not just a theory. We nearly lost the brilliance of Einstein because he was a Jew at a time when academic opportunities were frequently denied to Jews. What we will never know is how many other Einsteins we have lost because their race or gender made them invisible. Dorothy Vaughan, an African American mathematician who computed the complex glide path calculations that enabled our astronauts to safely return to earth in the 1960s, was working as an invisible mathematician leading the group of super-smart black women who did human "computing." They checked the work of male engineers to ensure their math was correct. She taught herself and her entire team the new computer language FORTRAN to speed NASA's work. She did this without respect or positive support from NASA's "ruling class" of privileged engineers. As she said, "I changed what I could, and what I couldn't, I endured." So how many other "Dorothy Vaughans" have been marginalized because of bias? It is impossible to calculate the cost of unexpressed talent. But the cost is real, and it is killing us. Perhaps the reason human society has been so slow to embrace the ideal of universal respect and the eager inclusion of "others," is that we define the problem primarily as a moral one. Idealists take the moral high ground that it is unfair to systematically disadvantage people because of their gender or race. But this argument is difficult to win because our deeply embedded tribal instincts, and the invisible advantages of the dominant tribe, create a stream of self-justifications that the status quo is just fine. When a super determined member of the disadvantaged group somehow breaks through, members of the advantaged group perversely use that exceptional person as evidence that bias is not a limitation. 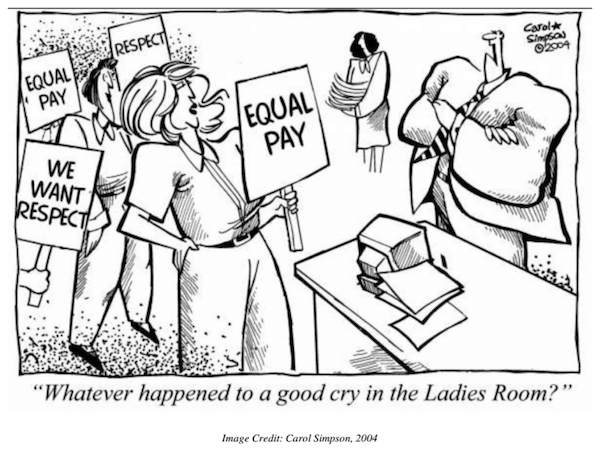 In my work for gender synergy, I have found that the practical argument for fairness, opportunity, and inclusion is much stronger than the moral argument for equality. The practical argument is simply common sense. What would be the result if you could release the full talent of all your people, rather than just the white males with Ivy League degrees? 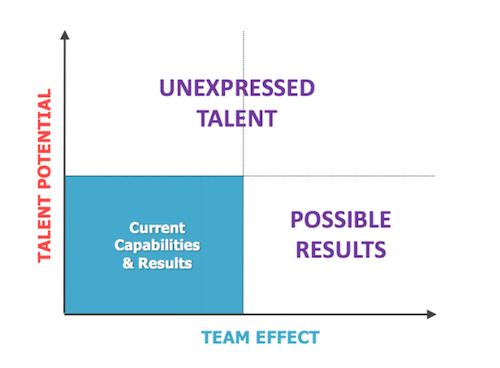 As you can see from this graphic, all teams, organizations, and societies have an invisible field of unexpressed talent and unrealized, but possible, results. The value creation potential of that invisible field is immense. Consider a different way of thinking about civil rights. We have tried moral argument for over 150 years. One group of white people has pushed to expand equality in all its dimensions to cover African-Americans and other minorities because if "all men (people) are created equal" no one should be systematically handicapped by substandard education, inadequate access to healthcare, or unequal justice. But, yet they are. What if instead of stressing the moral argument, we consider the practical one? What has been the loss of talent to our nation and the world by tolerating and even fostering policies that legitimize inequality? I can think of two industries, entertainment and sports, in which African-American performers and athletes have made exceptional contributions, and even dominate. You may not like rap or hip-hop, but it's a huge industry that has spawned the mainstream hit play, Hamilton. What if we never heard Ray Charles or Stevie Wonder? What if we never saw Michael Jordan or LeBron James play basketball? What if Kevin Hart never had the opportunity to make us laugh? Well, these are the people we know . . . but what we don't know are all the millions of other talented Black Americans who could have been great physicists, tech entrepreneurs, and architects. The voices of self-justification might argue that bias doesn't hold greatness down. So, their reason we don't have more minorities or women doing remarkable and amazing things to make our world better and more enjoyable, is because they don't have the gumption or the talent to do so. That kind of thinking is not only scientifically wrong, but it also makes me furious. If you have never been the object of discrimination and bias you cannot know how discouraging it is to see members of the dominant group get advantages and opportunities that they don't particularly deserve, while you work with all your energy, creativity, and commitment only to be overlooked, ignored, or patted on the head like a loyal dog. The Psychology of Discrimination is a real and it has measurable impact. It causes those who are disadvantaged to lose their confidence, extinguishes initiative, and increases hopelessness. That is the logical response to almost never getting the expected reward of high effort. When members of the privileged group see the low initiative behavior their bias actually creates, they smugly believe they have a right to be privileged because they are superior. When the self-satisfied members of the privileged group are then asked to take the moral high-road and be inclusive of people they privately consider inferior, bias becomes malignant. Frankly, I've never seen the moral argument for diversity and inclusion successfully drive culture change. What I am experiencing is the competitive demands of the disruptive world of business causing leaders to seek new ways to release the talent, and empower the abilities of women and disadvantaged minorities by changing the way work gets done. In every organization I have the privilege to work in, real work gets done by teams, and teams of teams, using creative collaboration. Teamwork is not natural in authoritarian, hierarchical organizations. So, there is a lot of breakage. But with crisis comes opportunity. We have reached a point in both business and the wider society that we simply cannot afford to marginalize and systematically disempower women and "others" because they think differently or act differently. It's differences that create the intellectual friction that start the fires of new solutions and breakthrough opportunities. To reach the moon, NASA had to listen and learn from a black, female mathematician. To grow a business, avoid war, stop environmental catastrophe, and create a sustainable future, we must seek to empower the talent of every person. To survive, we must face the fact that tolerance and intolerance are not intellectually equivalent values. Tolerance, respect, and reciprocity create better outcomes then intolerance, disrespect, and selfishness. That's not only a moral position; rather, it is the findings of decades of anthropological research on long-lasting societies and thriving organizations. Empowering everyone's talent requires a new way of leading, new cultural dynamics, and the wisdom to listen to the genius of people who know what you don't. Today, ask someone you rarely listen to for their best idea on how to solve a problem you have. Listen with all your energy. Acknowledge the grain of gold in their response. Watch them bloom. Imagine if all the talent in your organization bloomed. Imagine a world where everyone's talent bloomed. We need A Million SMART Women and men who support them to step up and create that world. MIT research confirms that most women are less likely to be driven by personal status, and more likely to be motivated by team success. We need team success now. We insist on women's leadership parity because it is the only proven path to sustainable prosperity. One woman at a time,A Million SMART Women will buy-in and believe this fact to be true, and we will change the future for ourselves, our children and our grandchildren. We need your involvement. Join our Facebook page. Follow us on Instagram. Follow us on Twitter. Go to our Website. In the coming months, we will be rolling out a Women's Leadership Learning Center, an Ambassador program, and much more. Please join us. The world needs you to LEAD.